by the application of electric current. The ink is then expelled through the nozzle and is applied to the previously treated surface of the fabric. For this Marc Cain uses reactive dyes they produce themselves – a special class of dyes with which it is possible to create exceptionally brilliant prints. These have been exclusively developed and manufactured for Marc Cain since 2007. The interplay between the complex printing process and the special dye causes the product to be "dyed through". The dye does not just lie on the surface of the fibres but penetrates the fibres to make a permanent bond. As a result the print cannot tear or break and the feel of the knitwear is maintained. 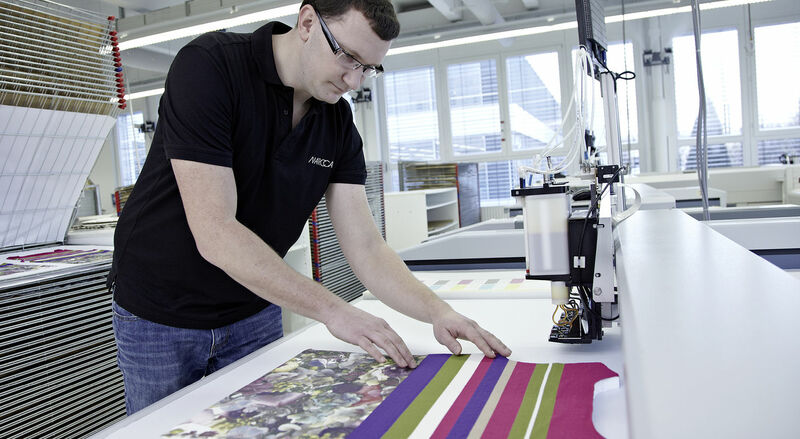 Marc Cain is at present working on the fourth stage of development of the printing machines to maintain and extend the company's competitive lead in digital printing.